The U.S. economy, including small businesses and consumers, derive enormous benefits from international trade on the energy front, and policymakers need to appreciate this economic fact of life and not undermine such trade with misguided measures, including any undermining of free trade with Mexico and Canada via NAFTA renegotiations. The U.S. Energy Information Administration recently released a few reports spelling out some positive trends on trade. First, U.S. natural gas production continued its decade-plus growth in 2017 (up 1 percent over 2016 and just slightly below the 2015 record level). Recall that the U.S. surpassed Russia as the world’s top natural gas producer in 2009. 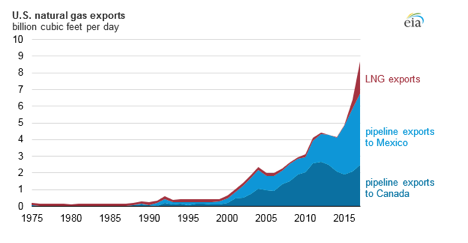 As noted in the following chart (courtesy of the EIA), U.S. natural gas exports have grown dramatically. “U.S. natural gas pipeline capacity into Mexico has also increased over the past few years, driven by growth in demand for natural gas from Mexico’s power sector and favorable prices compared with natural gas supplied by LNG shipments. U.S.-Mexico natural gas pipeline capacity is currently 11.2 Bcf/d, with another 3.2 Bcf/d of capacity scheduled to be added later in 2018. Pipeline exports to Mexico have grown along with pipeline capacity, more than doubling since 2014 and averaging 4.2 Bcf/d in 2017. “U.S. LNG exports increased dramatically over the past two years as new liquefaction capacity has come online. The only liquefaction terminal previously operating in the United States—the Kenai LNG terminal in Alaska—ceased operations in 2015. In 2016, as the Sabine Pass LNG terminal in Louisiana began to ramp up operations, U.S. LNG exports increased. Sabine Pass now has four operating liquefaction units, with a fifth currently under construction. 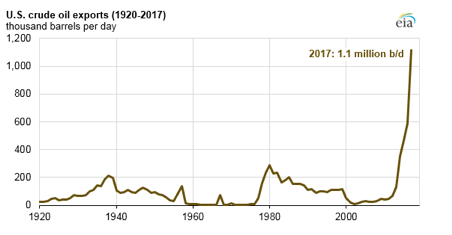 The approval and building of LNG export facilities have been big economic plusses for the U.S.
Second, U.S. crude oil exports have jumped dramatically since limits of crude exports were lifted in December 2015 (see the following chart from the EIA). In fact, crude oil exports nearly doubled in 2017 compared to 2016. Third, an EIA analysis zeroed in on U.S. energy exports to Mexico exceeding imports for the third year in a row. But the level of exports relative to imports isn’t the key economic point. Instead, the standout point in this analysis is the dramatic recent growth in U.S. energy exports to Mexico, with a particular big jump higher in 2017 over 2016. For good measure, Mexico ranks as the top destination for U.S. LNG exports. ● and 51.5% of employer firms among oil and gas field machinery and equipment manufacturing businesses have fewer than 20 employees. Increased energy production, thanks to a significant degree to expanding export markets and opportunities, is great news for small business. Second, and finally, this energy trade story should make it clear that U.S. policymakers should be working to reduce barriers to trade by entering into and expanding free trade agreements. That includes strengthening and modernizing – not undermining – NAFTA, given the noted importance of U.S. energy trade with Mexico and Canada. If NAFTA were to go away, the resulting higher tariffs and other trade barriers would mean reduced U.S. energy production, jobs and growth in the United States. Indeed, that goes for trade more broadly. If the U.S. imposes tariffs on other nations, those countries inevitably will retaliate, and given U.S. global energy leadership, U.S. energy exports will likely become targets for such retaliation, including U.S. refined petroleum products. On the governmental front, a coherent energy agenda features the reduction of onerous taxes and regulations – that process has been moving ahead over the past year-plus – and reduced governmental barriers to international trade via free trade agreements. The Trump administration has not accelerated the pace on negotiating free trade accords (and unfortunately the U.S. has exited the Trans Pacific Partnership); has created uncertainty around existing trade accords, such as NAFTA and the U.S.-South Korea accord; and will be imposing tariffs and is threatening more. Raising taxes and imposing more regulations – whether domestically, or on entrepreneurs and businesses in the international marketplace – work against prosperity for U.S. businesses, workers and consumers.